It's hard to call yourself a geek if you haven't built at least one robot. I recently heard about RoboGames, supposedly the world's largest open robot competition. A friend and I decided to built a robot to compete for the 2010 games. RoboGames has over 75 events available to compete in, such as kung-fu, sumo, soccer, and everyone's favorite: BattleBots. We decided to try our luck in the MechWarrior division. Building a biped robot from scratch is no easy task, especially given that neither one of us are engineers. Luckily a company known as Lynxmotion has a number of starter kits just for robots of this type. We went ahead and picked up their biped kit known as the BRAT, along with the upgraded servos package for all the extra weight we would be adding later. 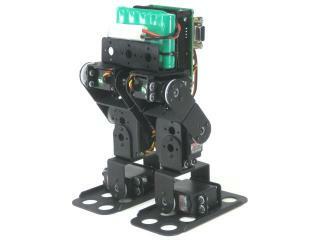 The servos and basic logic are controlled by Lynxmotion's Bot Board II powered by a BASIC Atom Pro processor. To power everything we started off with rechargable AA Ni-MH batteries packed in battery holders. We later moved on to 3.2V LiFePO4 cells for less weight and longer life. We started with the supplied wireless PS2 controller for our main controls but our goal was to use the power of an Android phone (how iconic) to really make it shine. It has all the features we need such as a camera, 802.11g, bluetooth, a plethora of sensors and plenty of processing power. Plus we didn't need to buy one since both my friend and I already own one. For weapons we went with dual Airsoft cannons designed for model tanks. They are super small and lightweight but still pack quite a punch. We made some ammo hoppers out of Red Bull Energy Shot plastic vials. The competition also requires the purchase of hit-plates and a corresponding logic board for the scoring system. The kit from Lynxmotion was rather straight forward. Following their online instructions we had the robot together and walking in a couple hours.